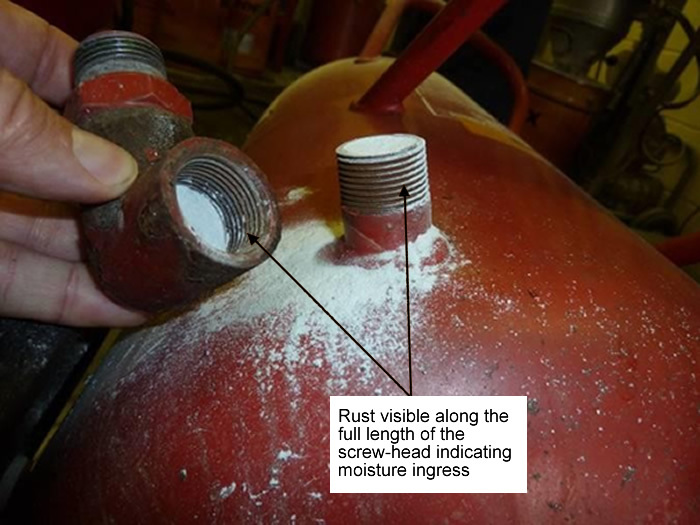 'Norfolk Range' large dry powder fire extinguishers, manufactured before 2009, may be affected by moisture ingress at a threaded joint at the base of the unit, rendering the unit inoperable. The problem may not be identified during routine service inspections. At a recent fire on a chemical plant, three wheeled dry powder fire extinguishers, containing 45kg of Monnex dry powder, failed to discharge when activated. This safety alert relates to dry powder units manufactured between 1970 and 2009. An identifying feature of these units is that the discharge hose is coupled at the base of the unit via a threaded metal elbow joint. Photograph 1 shows the type of unit covered by this alert. If you are unsure if your units are affected by this safety alert, consult Britannia Fire Ltd. 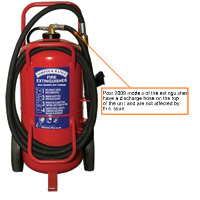 The units operate by opening a CO2 cylinder attached to the body of the extinguisher. 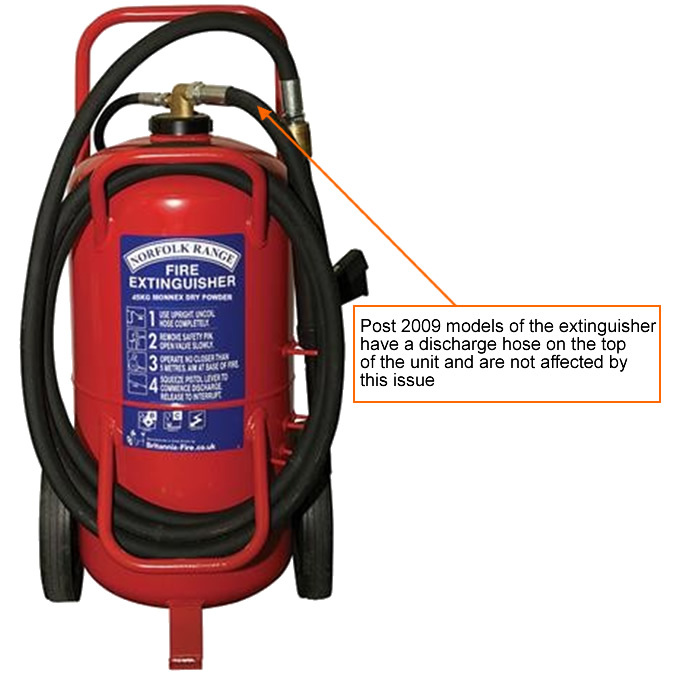 The main body of the extinguisher holds the dry powder. The powder is discharged through a hose and is pushed out by the pressure of CO2. The units in scope of this alert have a discharge hose attached to the base of the body of the extinguisher by a piped metal elbow. HSE examined three of the above units that failed to operate. Each had rust visible on the inside of the elbow joints. The extinguishers had been kept outdoors under plastic covers and had been serviced every six months. The service engineers had noted the rust but it was not thought to affect the operation of the units. The flexible discharge hose is normally removed during servicing however the elbow joint is not usually disturbed. It is believed that water ingress at this joint resulted in caking of the dry powder within the elbow joint. The caked powder may fall back from the discharge tube into the body of the extinguisher and so not seen during basic servicing. 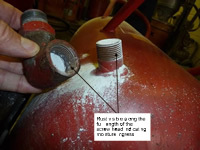 Upon activation of the extinguisher, the caked powder can block the discharge hose and render the unit inoperable. Photograph 2 shows the rusted joint and caked powder from a unit that failed to operate. When the flexible discharge hose was removed the blockage was not visible. It was only identified when the elbow was removed from the body of the extinguisher. The revised design of ‘Norfolk Range’ extinguishers produced by Britannia Fire Ltd is not affected by this problem. The design of the later versions features hoses mounted to the top of the unit, as shown in photograph 3. You should inspect any ‘Norfolk Range’ wheeled dry powder fire extinguishers and confirm if you have a unit with a discharge tube connected to the bottom of the unit. 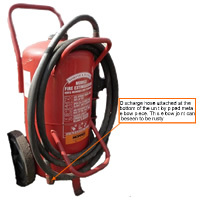 If the extinguisher has been left exposed to adverse conditions since its last extended service, the condition of the elbow joint should be examined by a competent fire extinguisher service engineer. Service engineers should advise clients to consider storing this type of extinguisher in a location where it is protected from rain or very damp conditions. Health and Safety Executive online advice form.